The state insists that Boston Duck Tours has known about the spotty driving record of the duck boat driver involved in this weekend's deadly crash for years. According to a statement from the Registry of Motor Vehicles, "…employers are provided upon request with a 10-year driver record that includes any unresolved offenses outside that window." The RMV says Boston Duck Tours has requested and received the driving record of 41-year-old Victor Tavares every year since 2010. Boston Duck Tours CEO Cindy Brown told necn Monday that the company checked Tavares' record two months ago and received "very different information" from the RMV. In a statement issued Tuesday afternoon, Boston Duck Tours said it has learned that there is a "significant difference" between the driver's record provided by the RMV and the "driving history," which goes back to when the license was issued. 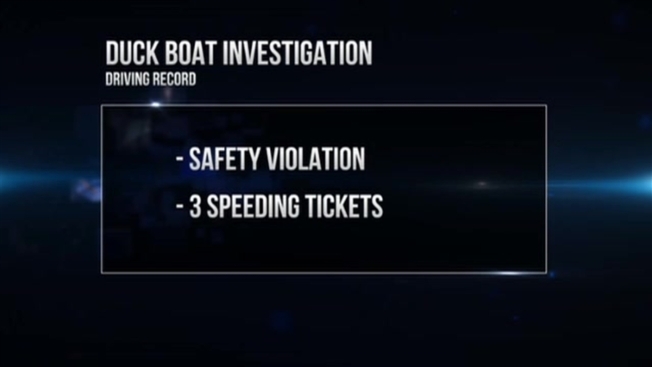 "This particular duck tour driver had an exemplary record while driving for us the past six years," the statement reads. "Safety remains our utmost priority, as Boston Duck Tours currently operates a brand new fleet of Truck Ducks, which meet all current Coast Guard and Department of Transportation regulations. The driver involved in Saturday’s accident is currently under suspension, as part of standard operating procedure." Tavares, of Brockton, has not been charged in the accident that killed 28-year-old Alison Warmuth on Saturday. What's Next for Boston Duck Tours? But according to the RMV, Tavares has a lengthy and problematic driving history that includes five license suspensions, 10 speeding tickets, safety violations and a 2003 accident for which he was found to be at fault. To be a tour bus or similar operator in Massachusetts, a driver most hold a Commercial Driver's License, a Coast Guard Captain's License and a state-issued Motor Bus Driver Certificate. On that application is a line where the state needs to say whether the "driving record cleared" - yes or no. Necn has asked if Tavares' driving record was cleared. The state has not answered our inquiries. Massachusetts Gov. Charlie Baker told necn it is Boston Duck Tours' responsibility to make sure their drivers are safe. "I think the burden on the review piece belongs to them and their insurance company," Baker said. "This is a tragedy and we'll get to the bottom of it on our end to find out who knew what when, but I think (Boston) Duck Tours has a pretty exemplary record around here."